HE HOLD HER ARM!! OMG YOU TWO WHAT ARE YOU DOING TO ME!! WHAT there's a picture of them eating dinner together! I need to see this picture! This is my first time posting on Soompi, but I've been watching dramas for almost two years now. Ironically enough, the first drama I ever watched was Playful Kiss. I've enjoyed Jung So Min's work ever since, so I follow her closely. To date, I think this is my favorite drama of hers. She's excellent - so is Kim Young Kwang. I wasn't expecting to ship anyone, but just how precious are Hae Sung and Ddol Mi? Whether they're teasing each other, laughing at each other, or even scolding each other, it brings a lighter element to an otherwise intense, heavy drama, which I really appreciate. The chemistry is so there and I honestly couldn't imagine anyone else playing these characters. And that selfie is so adorable! KYK is so tall that he has to help hold up/steady JSM's arm. hehe don't worry, like @sakura22 said some relationships started off like that right? hehe so lets keep our fingers crossed! My first So Min drama was Playful Kiss as well. I'm not sure, but are you guys talking about this pic? 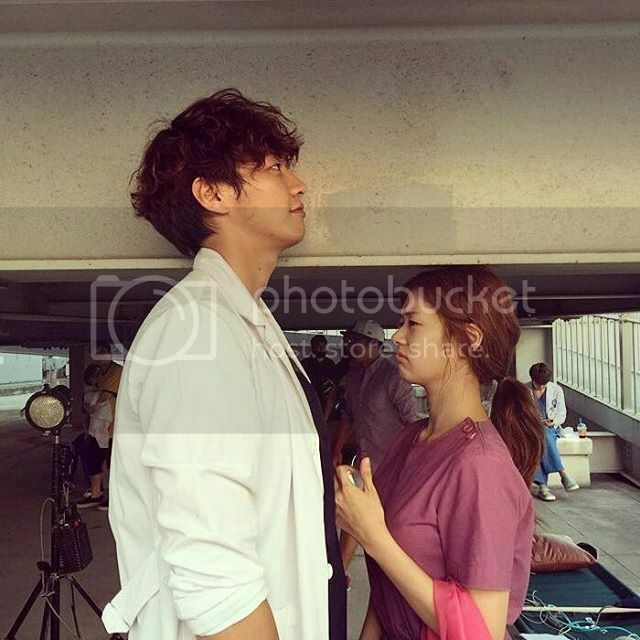 130615 Jung So Min and Kim Young Kwang spotted at a BBQ restaurant in Chuncheon. Thank you also @angelangie for that selfie. Anything about them makes me happy. Obviously, I'm not a fan of them. JSM is my bias. Just like @LavelyShai, I came to like her the first time I've seen her in Playful Kiss I find her character portrayal not annoying unlike how O Hani has been played in other version of that drama. Instead, I find her cute and adorable. I've seen her other dramas but don't usually ship her with her leading men except with KHJ which I now laid to rest, forever. Hahahah! Actually, I find KYK to be of very good chemistry with Han Groo in Can We Got Married and I like them. And I also don't usually post in a couple thread. So I don't know what's gotten on me now that I'm shipping JSM and KYK . Maybe their chemistry overwhelmed me sooooo much that I wannnt more of them. Btw, am i the only one thinking somehow KYK looks like Lee Kwang Soo? Maybe their height or something. I am a fan of LKS as well! hahaha keep them coming! and we'll all die because of their cuteness lol. they even share a bottle of water, eh?? argh these twoo.. The press con pictures. I've watched their previous press con clip when they were sitting next to each other answering questions and teasing each other.